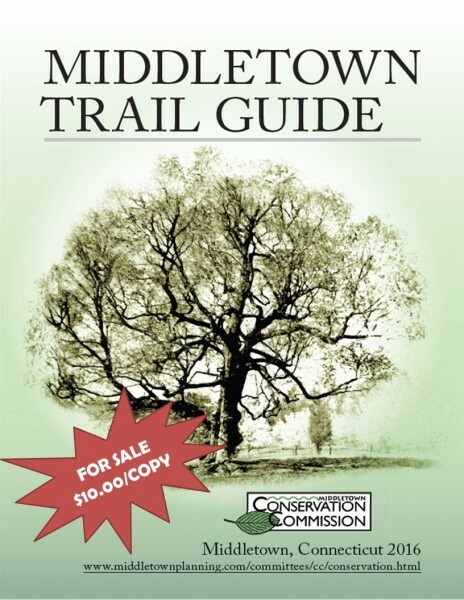 Mayor Daniel T. Drew is excited to announce the release of the 2nd Edition of the Middletown Trail Guide. The Trail Guide, which was last updated in 2004, is the result of the diligent work and perseverance of the members of the City’s Conservation Commission and community volunteers along with assistance from City staff. The updated trail guide includes maps and narrative descriptions for over 20 areas for hiking, biking, nature viewing and kayaking. Some new additions to the trail guide include the nearly 5-mile long multi-use trail, a 1.6-mile downtown walking loop, and the Mattabesset River Canoe/Kayak Trail which utilizes the City’s new car-top boat launch off Johnson Street. The guide is an excellent tool which can be used by residents and visitors of all ages to explore some of Middletown’s lesser known open space and to appreciate all the areas the City has for healthy, outdoor recreation. The guide includes trails which accommodate users of all abilities, skill levels and ages. The narrative descriptions and color photographs provide readers with an excellent overview of all the attributes each area has to offer as well as directions, parking, and descriptions of the terrain and trails. The Mayor thanks the City’s Conservation Commission for their countless hours and hard work in order to get the trail guide updated. The Mayor also thanks Connecticut Forest and Park Association for their contribution to the Trail Guide. Currently, there are many initiatives underway to enhance the City’s open space and the trail guide is a great way to help the public get outdoors to enjoy our vast open space. At this time the guide is only available online at www.middletownplanning.com. (Scroll down to Announcements.) Printed copies are expected to be available at an event celebrating the new trail guide in the Spring.